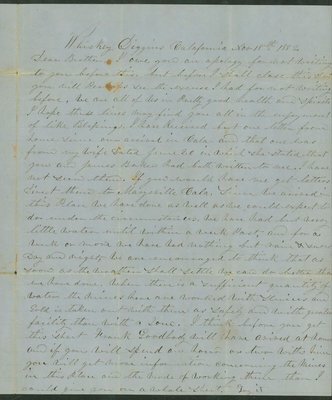 George Huntoon writes to his brother about his experiences at Whiskey, Diggins, California, panning for gold. before. We are all of us in pretty good health and spirits. could give you in a whole sheet. Try it. which I expect she has got by this time and 10 oz. long as I can get moderate wages where I am. it was not enough to astonish anyone. dollars per day[.] The wages will be better in a few days. Sacramento, and I will get it from there by express. I was to Dixon [?] Springs, and Hamblin George has gone home.